Well, we’ve finally arrived at the last of the healing trifecta! Yes, we’re discussing spiritual or soul healing. Again, I’m no minister and have no pastoral counseling training. What follows are things I’ve learned over the years – either from personal experience or from those I know, especially my Hearth Sisters in the Daughters of the Sacred Grail. 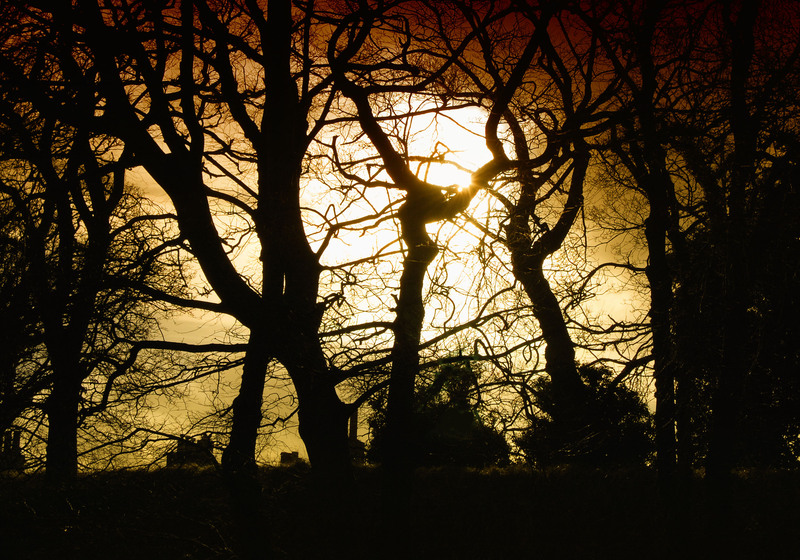 These trees make a beautiful sight with the sunset in the background. This seems so basic, but many of us run from one task to another without appreciating the beauty of our world. Watching a glowing sunset or clouds drift across a full moon, taking a walk in a woods, viewing an art exhibit, listening to gorgeous music, tasting fine chocolate (or whatever you prefer) are all ways of experiencing beauty. Sometimes watching something ordinary and seeing it with an open mind and heart helps us appreciate the extraordinary gifts we have. Frankly, nothing takes my breath away more than watching my dog Zoe running in a field, free of inhibitions and full of joy. Whatever captures your fancy, having images and memories of experienced beauty is helpful when we face ugliness in the world or within ourselves. Yet the ecstatic experience is really part of the human experience. Sadly, some people turn to drugs to achieve an ecstatic state, though modern versions of it include dance clubs and rock concerts. A drum and fire circle in a safe environment where people feel comfortable to drum, sing, and dance is a great way to cut loose and connect with that primal side. This can help balance our lives and spirits by allowing us to feel the wild yin to our cultured side’s yang. Walking a labyrinth is a meditative experience. Well, you just knew this was going to be included, didn’t you? The ability to clear the mind and focus on one thing or nothing) can help you deal with stress and develop better focus. Whether you prefer the more traditional Buddhist style of meditation, guided imagery (what I call journey meditations), or another technique, being able to still your mind and body and calm the soul has tremendous value. 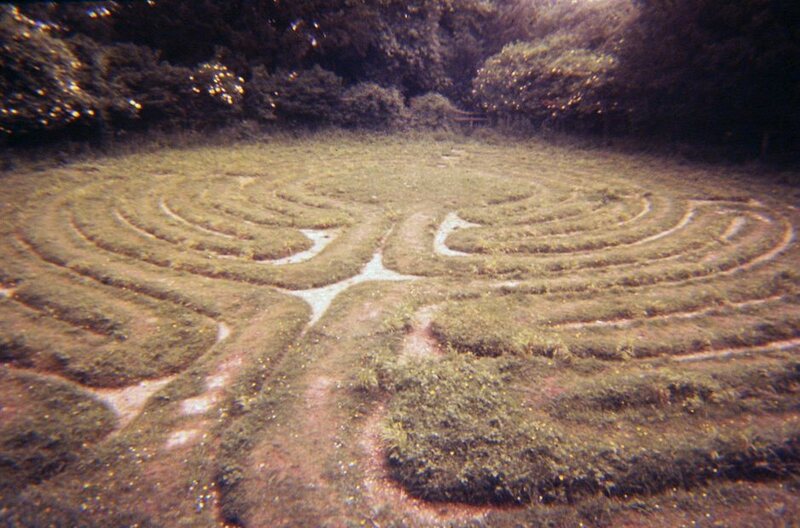 A physical method of meditation is walking a labyrinth. Walking the candlelight labyrinth at the Pagan Spirit Gathering a couple years ago was a tremendous experience of going within my soul. However, we can’t always set up a labyrinth in our yards or homes, but you can achieve some of the same goals using a finger labyrinth. There are labyrinth patterns to download here: http://labyrinthsociety.org/download-a-labyrinth. OK, trance has connections to both the ecstatic state and meditation. But it can be a great alternative to traditional meditation. It still helps you to disconnect and rest the conscious mind and tap into the subconscious. Chanting, dance, breath work, hand drumming (or listening to) certain rhythms, or spinning wool with an old-fashioned drop spindle can well known ways to achieve a trance state. Yoga is another tool. Some people trance very easily by doing repetitive tasks such as crocheting or knitting. And don’t laugh, but I’m pretty sure I tranced once while snapping a wheelbarrow load of green beans! You thought this was going to be a long section, didn’t you? Well, I’m just including it in the list because it is important, but I’m not going to delve into right now. Shadow work can be heavy stuff, so it will get a couple posts all to itself later. Thank the gods February is over. February tends to be the month I could really live without – by the time we’ve made it through the activity of the fall and hubbub of the holidays, my introverted soul feels as if it’s been rode rough and put up wet, as they say in Westerns. So January and February are usually my recuperation months. I limit my social outings and just veg out at home. Read a lot, write some, make brewing a pot of tea a habit, and so forth. This helps me to recharge for the upcoming activity of the spring. But this year, far too many events were vying for my time in January and early February. So this introvert stretched herself a little too thin. Which brings me to my next topic: healing the mind. This is a tricky subject. After all, I’m no psychologist or therapist – just an average person. But one thing I’ve learned over the years is that understanding your nature and then learning how to nurture it is important to becoming happy and whole. So forgive me, but I’m using a couple personal experiences to help muddle through this topic. For years, I felt the urge to keep myself away from noisy, crowded elements of society. Yet, people expected me to attend parties and events with them – and looked at me oddly if I expressed a desire to avoid them. It wasn’t until my late 20s that I understood my dilemma: I’m an introvert. Introverts make up about 25 percent of the population and we recharge by being alone or in a peaceful environment. The rest of the population falls into the category of extrovert (though there are varying degrees of each) and these souls recharge by being in groups and high-energy environments. A self-help book called The Introvert Advantage helped me learn how to get the most out of life and stay energized without becoming a recluse year round. Following this book’s tips, I’ve done pretty well. It’s when disregarding my nature that I struggle with a lack of energy and a downward spiraling attitude. So the past couple weekends were set aside for me to recharge. In short, I went back to nurturing my nature. We can make goals for ourselves and try to do whatever it is we find in a Google search to improve our lives. But you could be going in circles if you don’t understand yourself first. Are you an introvert or extrovert? Control freak or a free spirit? Independent, codependent, or somewhere in between? Do you carry old wounds that direct your decision making? Identifying these things can help you see where you trap yourself into habits that aren’t good for your nature – and when you do things because of other people’s expectations. Yes, we need to let friends and loved ones know we care about them, but a healthy relationship allows flexibility so both sides of the equation balance. A friendship where only one person gets what they need emotionally is not a true friendship (a lesson I learned the hard way). Standing up for yourself and your needs isn’t selfish – it can help improve overall behavior and stress level and to avoid relationship-rattling mood swings. A better you can make things better for those around you. So how do you begin to determine your own nature? With all the distractions we have, it can be hard. Numerous tests are available online to help you determine your personality type – Jungian and the Myers-Briggs personality tests are well known. Just Google one of them and several options should pop up. Just please avoid the quizzes in Cosmo! Sometimes a simple examination of the self can help. 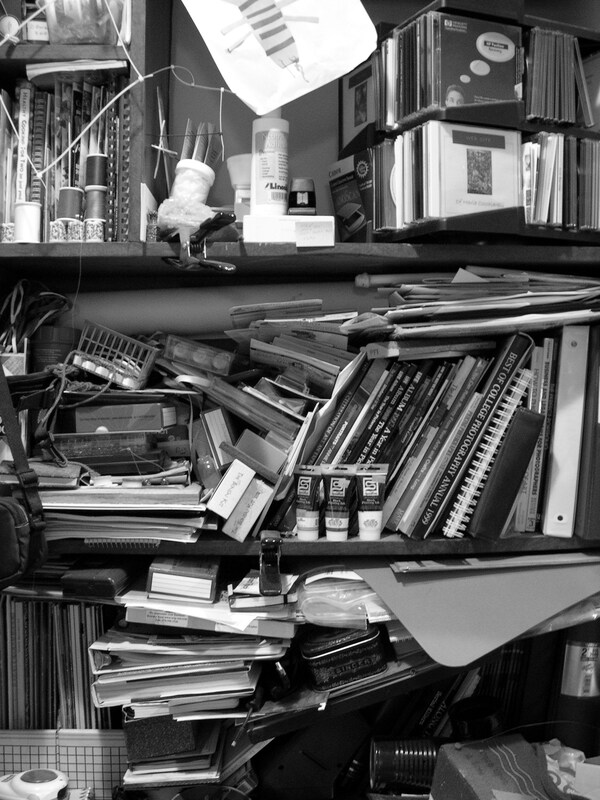 Clutter like this can drive some people up the walls. Are there tasks you do that you do not accept help on because no one else “does is right”? Maybe you should examine why you have to have such control over things. Does the idea of doing anything on your own – without a significant other or your best friend – freak you out? Perhaps there is a codependence or confidence issue buried there. Aside from answering questions like these, journaling about your feelings and your days can help you to discover things you could be doing differently to reduce stress for yourself or to make yourself happier. And once you understand your nature, it’s much easier to discover ways to nurture it. For serious issues I would always recommend seeking out professional help. Whether choosing a spiritual counselor or professional therapist, doesn’t our happiness and healthy minds deserve the time (and yes, sometimes the cost) to work through problems? I think so! Well, that’s all for now – and I should that’s plenty. Here’s hoping everyone’s March is starting off wonderfully!